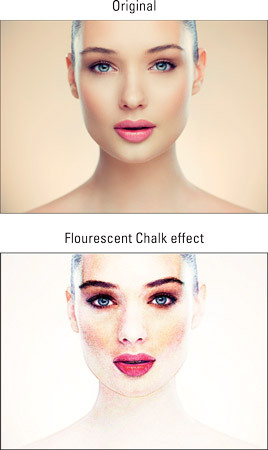 In addition to the multitude of filters at your disposal, Photoshop Elements provides a lot of effects that you can apply to enhance your photos, such as the Fluorescent Chalk effect. Remember that some effects automatically create a duplicate of the selected layer, whereas other effects can work only on flattened images. Select the Effects tab at the top of the panel. Choose your desired category of effects from the drop-down list in the upper-right area of the panel. You can view your styles and effects by thumbnails or by list. To change the view, click the down-pointing arrow in the upper-right corner of the panel to access the menu commands. Quick mode sports its very own Effects panel. Be sure to check it out — you’ll find effects not found in Expert mode. Click the Effects icon in the bottom-right corner of the workspace. To apply an effect, double-click it or drag it onto your image. You may also want to check out the interesting effects found in Guided mode. Elements 14 has totally revamped the interface of Guided mode into nicely organized categories with corresponding images. In Guided mode, you’ll also find the new Speed Effect, which gives your object a sense of motion. You can also apply an effect to type. Select your type layer and follow Steps 2–5 in the preceding list. A dialog box alerts you that the type layer must be simplified before the effect can be applied. Simplifying that layer, of course, means you lose the ability to edit the text.